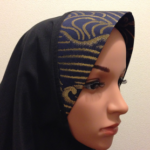 This is a 100% Made in Japan Hijab brand that uses the combination of Japan-made high quality materials, natural materials and traditional fabrics. We started in 2015 to provide materials and sewing work. With the thought of wanting to help the reconstruction efforts due to earthquake, the main manufacturing plant is located at Iwate Prefecture. 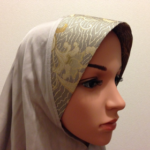 We want to introduce the inner hijab made from new materials. We will also hold business talks and orders meetings with buyers. We will introduce why we are particular about “Made in Japan”, and about the Japan-made materials used. 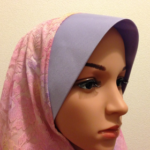 We will be selling the hijabs at a special price to visitors at the Expo. Please use this chance to pamper yourself, or get them as presents for your family! Feature: The brilliance of Nishijin silk, Japan’s handiwork, complements the elegant fabric that is smooth like silk, has good drape texture and soft to touch. The classic color fabric drapes gracefully, covering the upper body beautifully. The different shades of charm as sun shines on it, with the calm shade of grey delivers a image of high quality. It complements totally with the shine of Nishijin silk. Many arrangements can be made with pins since it is made very well. Feature: The brilliance of Nishijin silk, Japan’s handiwork, complements the elegant fabric that is smooth like silk, has good drape texture and soft to touch. Light and airy fabric is used, as the classic color fabric drapes gracefully, covering the upper body beautifully. The long length hijab in black can be used at many different occasions. It complements totally with the shine of Nishijin silk. Feature: A luxurious combination of Nishijin silk and Chambray fabric　Using conservative classic colors with natural beautiful luster, elegant and beautiful drape is reproduced. Hijab is made from light black twill fabric. It is a beautiful piece that matches the high quality fabric with the prominent grandness of Nishijin silk. It is light and does not wrinkle easily, so you can wear it comfortably. It is recommended to be worn with kimono. 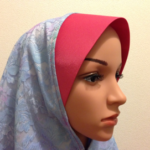 This hijab also offers UV protection. Feature: Elegant and gorgeous lace hijab This is a 3-layer hijab made from Japan-made lace, with gradation as the accent to the fluffy texture. The colors of the delicate floral lace and layer fabric are organized elegantly. Although it is structured with 3 layers, it is surprisingly light to use. The length is a nice length to just below the chest to allow lighter, cooler wear. (It is made by Japan-made absorbent quick-dry fabric) Perspiration is absorbed and released instantly, so you can enjoy the dry and smooth texture. Conditions of quantity: Depending on stock we plan to change the model. There are total 4 kinds in 4 different colors. ← HOYU BUSSAN Co., Ltd.